Dame Named Redd Designs: 244 - Newsboy Hat Pattern! So after a year or so of searching for the perfect crochet newsboy hat I found a really close one. It however wouldn't work out for me so I re-wrote it and changed it up and now have it to offer to you! I didn't do a gauge, I just dove in, so sorry about that lol. Using a bulky yarn (I used the beautiful James C. Brett Marble Chunky in Rosebush) and a J & G hook. You'll be crocheting in the round, so no joining rows! Just keep going! Huzzah! *With J hook, start by making a magic loop. *sk1, sc to 2nd last st., sl 1. Ch 1, turn. Do this 10 times. *using a needle, get rid of all your loose ends. *enjoy your super awesome and super easy hat! It fits 20-23" heads comfortably. 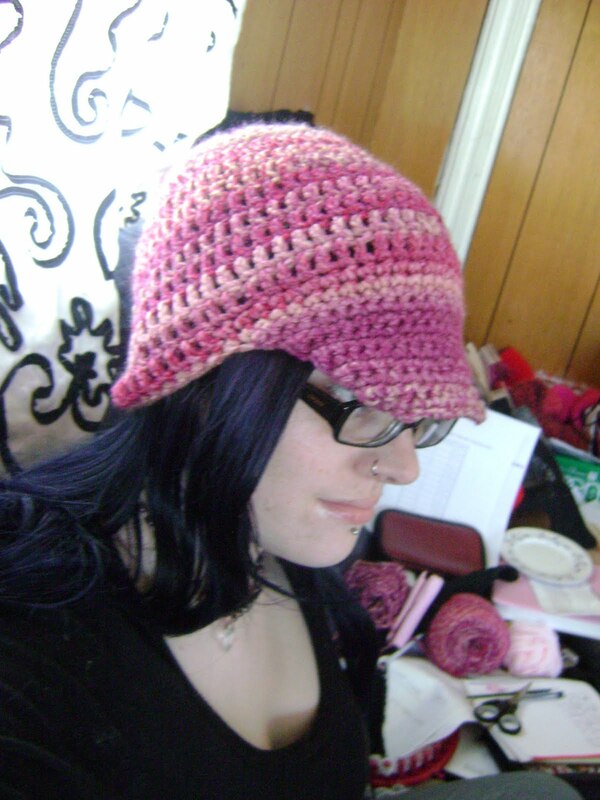 For more pictures of my new hat in the different stages, click here. Feel free to make this hat and sell it. Just don't sell the pattern since you got it for free :). Feel free to point them to here!